It’s Monday 22nd of February and we’ve just arrived in our digs at Maybua in Reine. At 9pm, after unpacking, we head out into the night to to find our bearings. 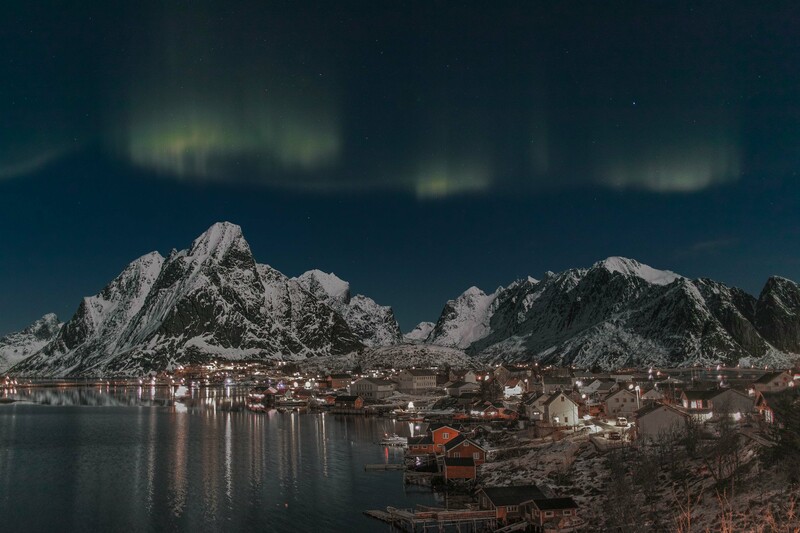 Ten minutes of slipping on icy roads found us on the edge of Reine, on the bridge, with the classic view of the town. At Polly’s insistence I’d taken the camera and tripod and as we looked at the view Polly thought she saw a smudge of green in the Sky. We set up, settled back and waited. Forty minutes later, and much colder, we were about to pack up, then one smudge, then another, and then our first view of the Northern Lights. What a greeting! Shot with a Sigma DP1 Merrill at f2.8, 8 seconds at ISO 100, manually focussed. Post processed in Lightroom. After losing the Sony RX1 Mk II (more on this in a later post), which I’d brought for this very purpose, I was worried about the Merrill’s ability to shoot cleanly at night. I shouldn’t have! At ISO100 and manually focussed, even at f2.8 the Merrill is super sharp. Wow, worth making the trip for!